One disadvantage that trombonists will face, as opposed to singers, is that our audience will not have the luxury of hearing the descriptive text. It would be considerate of the trombonist to provide the text and its translation in the program notes for the performance. What is the text literally saying? What does the text imply? Is a story being told? How does the music relate to the text? Is there text painting or ironic contradictions? What key is the piece in? Does the key relate to the meaning of the text? Was the piece written in the language of the composer? If so, certain diction/articulation choices may be implied. How would a singer sing this? Listen to lots of recordings and take what you like and what makes sound musical sense. How will you utilize certain musical nuances like vibrato and timbre? I will answer all of these questions with regard to Brahms’ third song in Four Serious Songs. to him that still may eat! how bitter, how bitter art thou! and cannot look for relief! How welcome is thy call! The implication of the text signifies two different views of death: 1.) Death is bitter to those who are happy and at peace with themselves on earth; 2.) Death is welcomed to those who suffer and are tormented on earth and long for relief that only death can give. 2. The declamation “O Death, O Death” is a descending interval of a third set at a perfect fifth apart. This descension suggests “death” as the body will fall. The orchestration changes when the text reads “unto him that dwelleth in peace…” It becomes much lighter and is also at a softer dynamic. The orchestration also changes when the text reads “O Death, how welcome thy call…” The piano plays steady chordal quarter notes, which offer a meditative quality. Also, in this section “O Death” is an ascending major sixth rather than a descending third, which suggests the soul rising to heaven. 3. The first half of the piece is in E minor, which goes along with the bitterness of death. The second half is in E major, which coincides with the peaceful nature of this attitude towards death. 4. 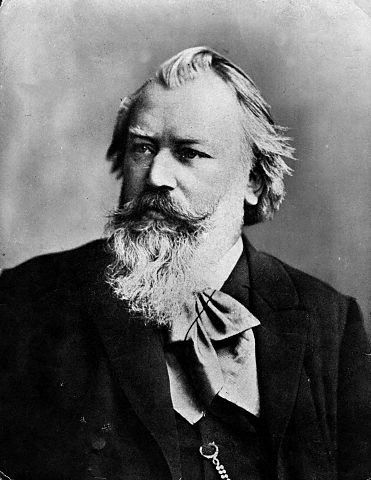 This song was originally written in German, the native language of Johannes Brahms. This is relevant because Brahms might not write specific articulations that a German speaker would intuitively know. “O Tod, o Tod,” must be played with an articulation matching the German pronunciation: listen. Likewise, many German words contain very consonant-heavy sounds, which must be mimicked on the trombone. 6. For me, I like to play the “O Death” declamation without vibrato. Doing this will help to demonstrate the starkness of the statement and give more contrast to the more lyric parts of the song. I also like to play with a very dark sound for the first half and a sweeter, more peaceful sound in the second half. I want to encourage trombonists and brass musicians alike to seek music of other instruments. Some other songs you may want to check out are ones by Mahler and Strauss– and there are many more to choose from! Posted in Uncategorized and tagged adapting songs for trombone, Johannes Brahms, trombone literature. Bookmark the permalink. Reblogged this on jessica d. butler, trombonist.